My daughter loves wearing black. She has so many different outfits in different styles of black. Oh, she wears colors too: black and brown, black and teal, black and white, black and multi colors. She also loves her jewelry. With so much black, making unique pieces for her can be quite a challenge. I do love a challenge. Creating jewelry for her keeps me on my toes. I wanted to share some of the totally different pieces I came up with. Beforfe I do that, let’s talk a little bit about the different kinds of black and what black says about the wearer, according the the language of clothes. Black can give the impression of gloom or guilt, depending on the style of the clothes and the fabric. Priests and monks have worn black as a symbol of the denial of secular life. Black velvet or stylish black dresses can also suggest sophistication……can say that the wearer has experience with the darker side of life. The richness of the fabric and the cut of the clothing suggests the level of sophistication. With white at the neck and wrists, there is the suggestion that the person is pure underneath. Black can also suggest age, maturity, sobriety and piety. There is dramatic b lack and Bohemian black or dancer’s black. Dressing in black turtlenecks, black slacks or skirt, black stockings or tights with longer hair originated in Paris after World War II. Later, denim was added. This type of clothing was worn by artists, intellectuals and students, indicating their serious nature, dedication to their art or work. Dancers had similar costumes, indicating sensitivty and a serious outlook. Actors, musicians, painters and poets have adopted this style. Motorcycle black dates from the 1940’s and draws on the styles of Italian fascists……..the leather jackets, boots, black jeans and t-shirts with zippers, snaps and studs are a more threatening style. Goth or punk wear evolved from this style also. 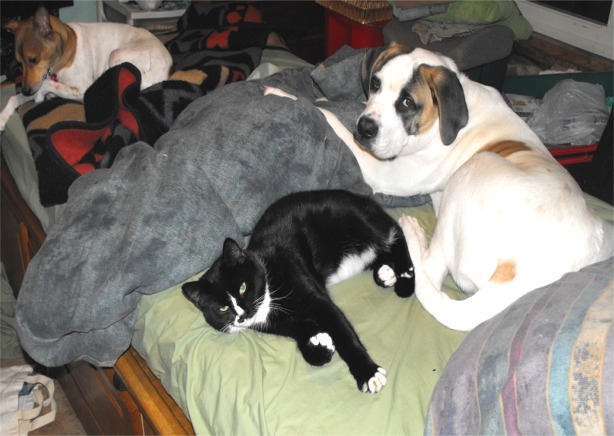 There is refuge in a layer of menace. Whatever your personal choice, black is beautiful. And, of course, black goes with any color. Here are some of the pieces I made to tantalize my child. 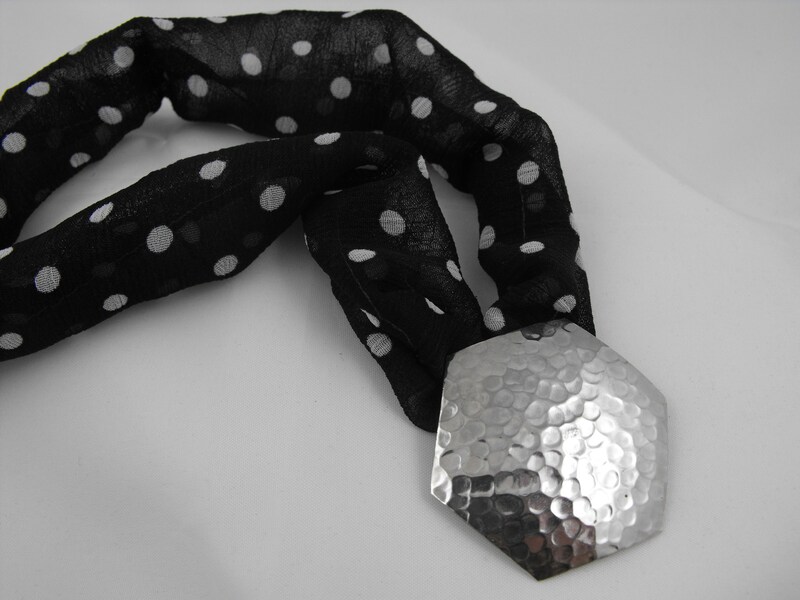 This is a really simple piece with and hammered silver pendant and some playful chiffon polka dot fabric. It looks great for work with a suit or jeans and a black blazer or adds a bit of style to a simple black dress. Polka dots indicate a playful nature in the language of clothes and these are just small enough to indicate a sense of humor to lighten up that serious black. 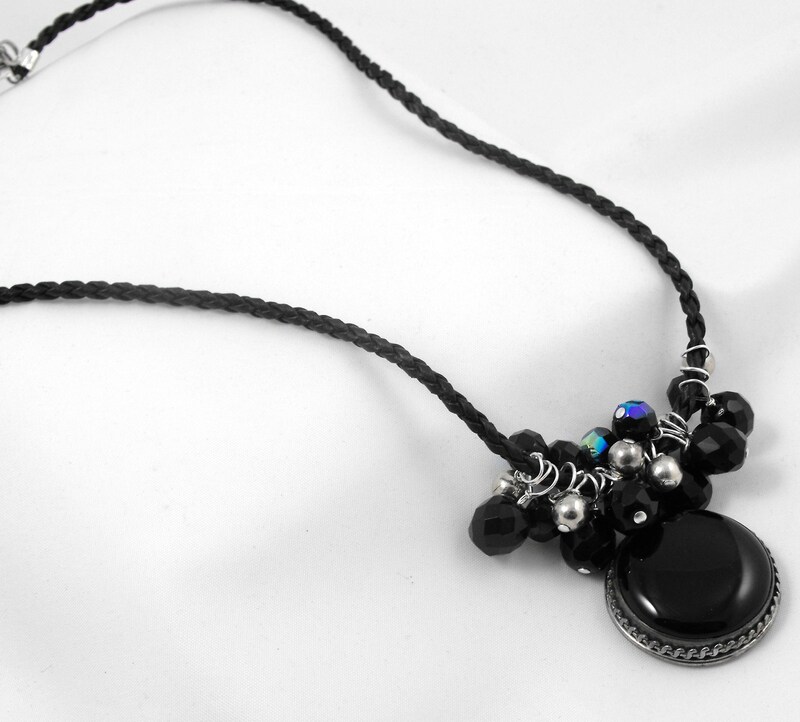 A black onyx and silver pendants (onyx is a very grounding and a very protective stone). 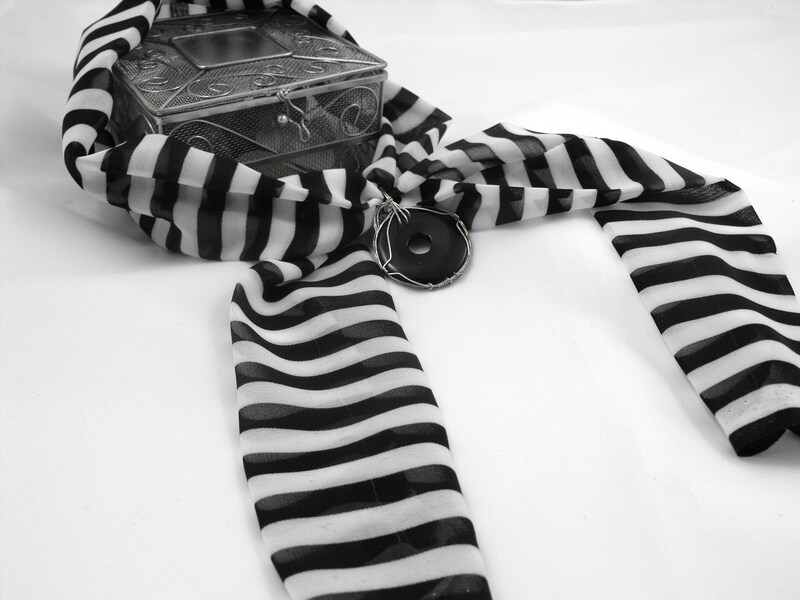 Black and white stiped fabric, the perfect mixture of innocence and naughtiness. I took the fabric a bit farther in this one, giving it a more playful aura, a sort of pirate flair with the fabric in a scarf instead of a collar. 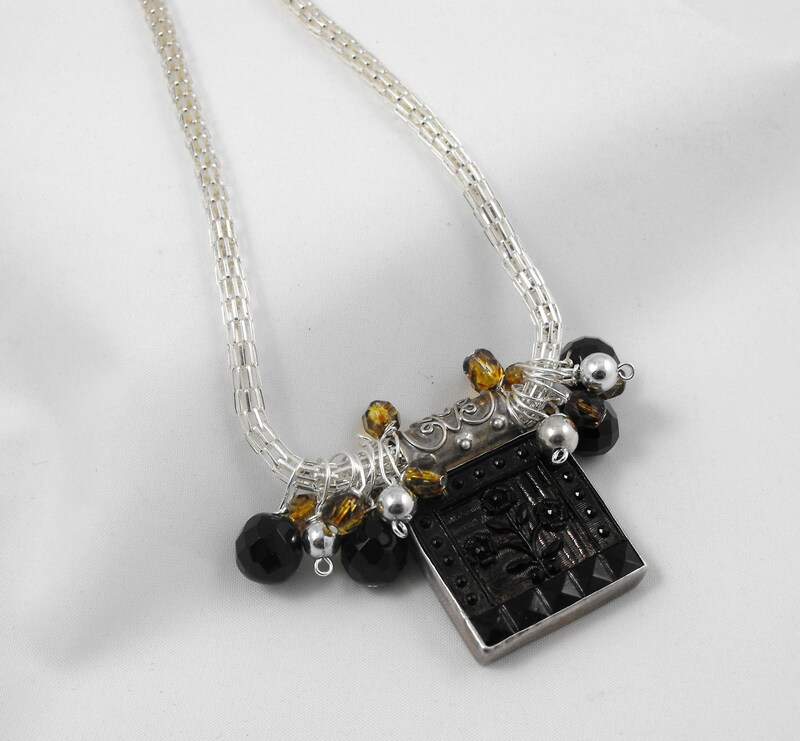 The pendant is an onyx donut wrapped in silver wire. This one could be worn at work or with a casual top and jeans. 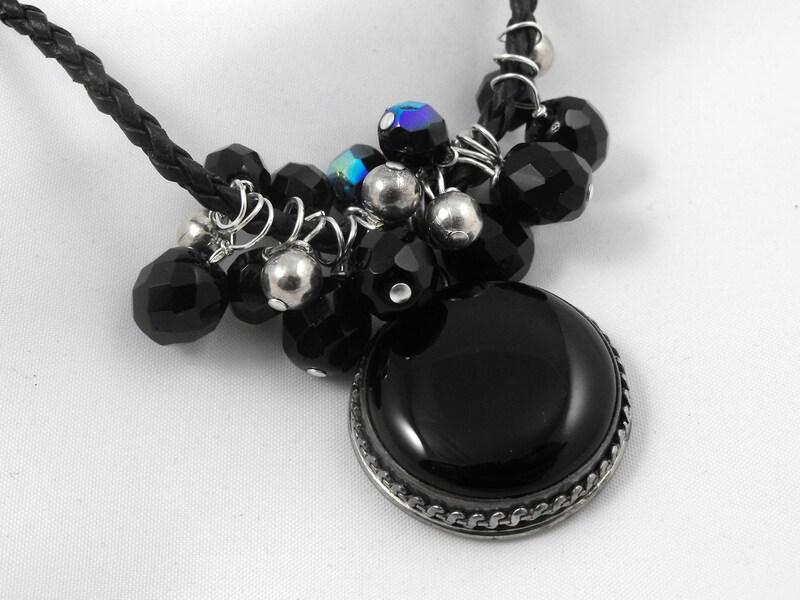 The black onyx and silver pendant is hung on a pleather cord and accented with faceted black Czech glass beads in plain black and some with an aurora borealis finish with hints of blue to break up the totality of the black and with silver beads. This one is a bit more dressy. 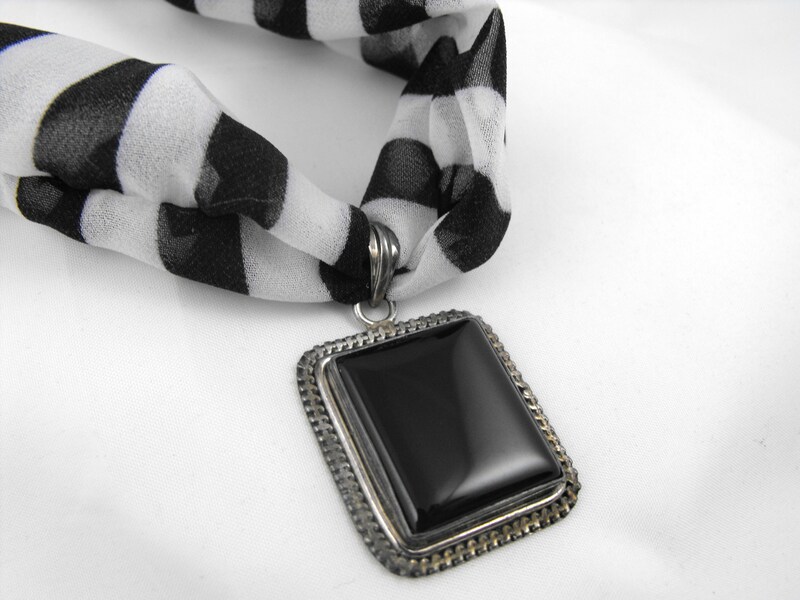 Pendant is black and deep brown glass. 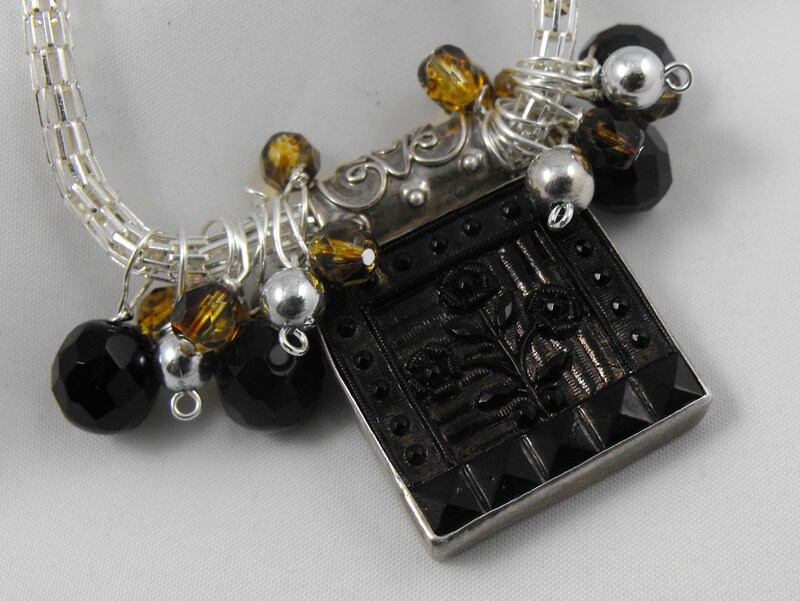 I used brown Czech beads, black Czech beads and silver beads. 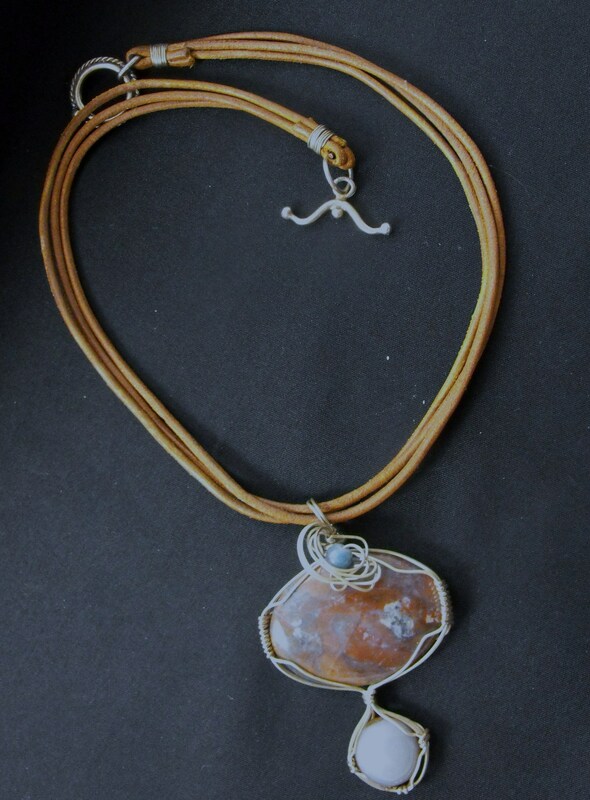 The brown beads help bring out the brown in the pendant. A silver lantern chain gives it a bit more of a formal look but it can still be worn with anything. She fell in love with this one. 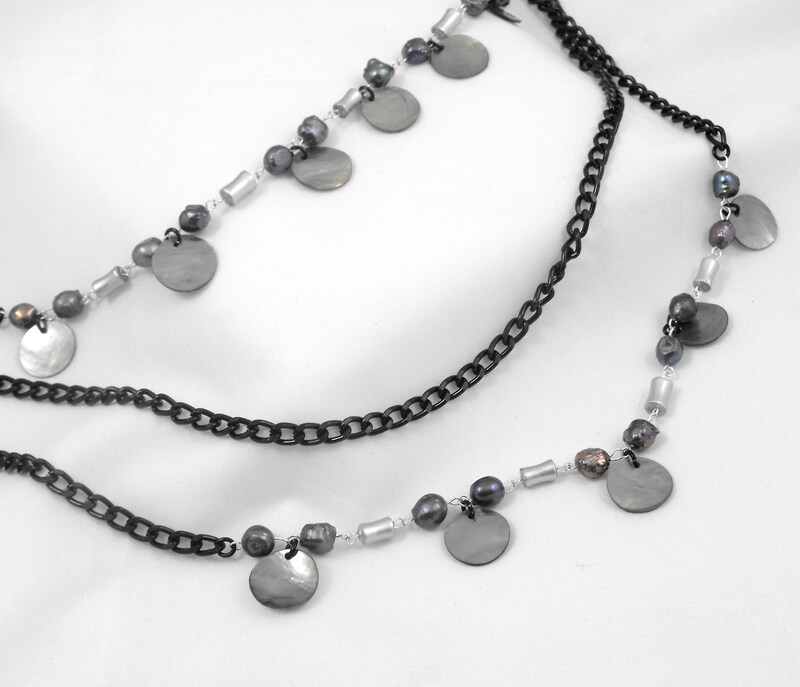 There are three tiers of black curbed aluminum chain, one plain, two with black freshwater pearls and silvery grey mussel shells. Wearing pearls helps bring wealth into your life, shells help you get organized. This is a very lightweight piece in spite of the three tiers. 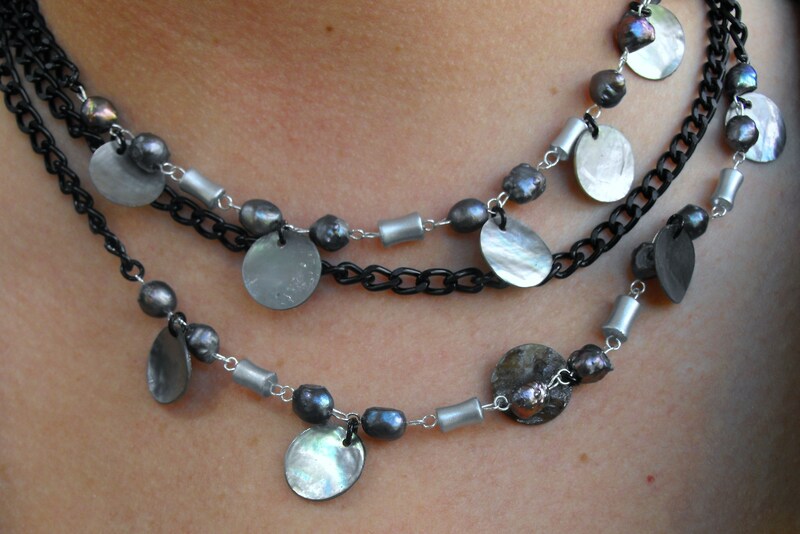 The misty gray shells give an ethereal, mystical tone to the piece. Well, I’m sure I’ll have more black pieces to make. These are just a few. 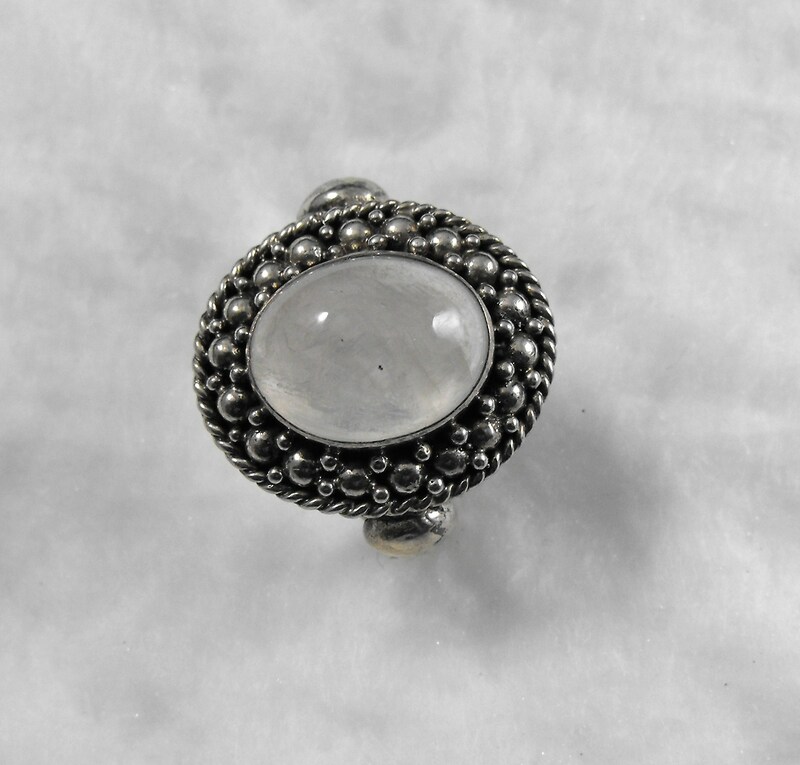 Where you wear a gemstone ring can make a big difference in how you receive external energy and also in the kind of energy you put out into the world. This can be really confusing so I’m going to try to simplify as much as possible. Your left hand is like a sensor. It listens and receives energy. Your right hand directs and conducts what you non-verbally express. First rule: do not wear rings on your thumbs. This blocks your chi. thumbs are your free will agents and do not like their energy blocked. Your pointer finger is associated with communications, goals, dreams and desires. On your left pointer, wear lapis lazuli to receive inner wisdom. 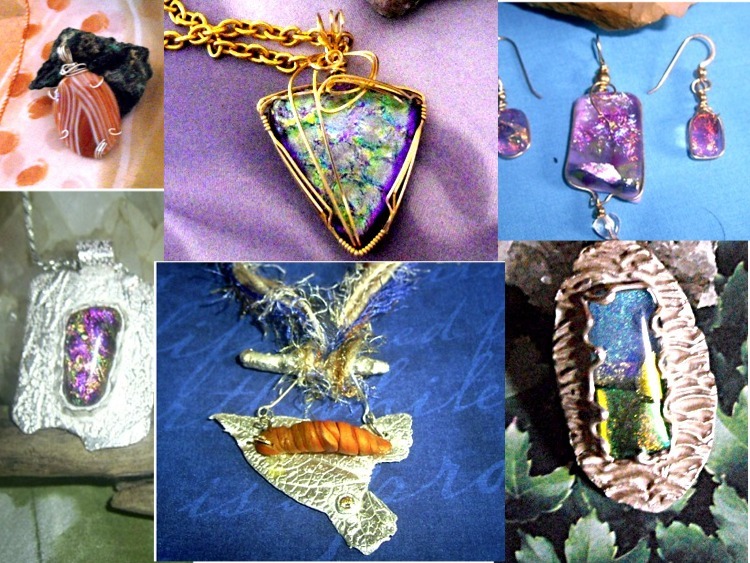 Wear shells, mother of pearl, garnet or moonstone for a love of self and for self confidence. Wear turquoise, sodalite, chrysocolla to calm and relax you. Wear blue lace agate to wash away depression. On your right pointer, wear lapis to share wisdom and knowledge. 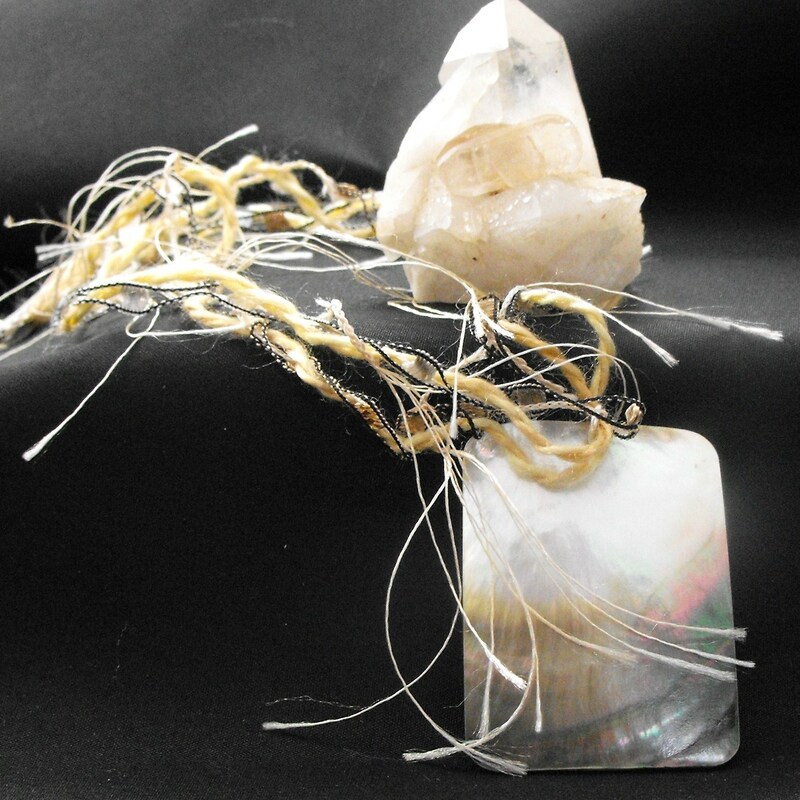 Wear shells, mother ofpearl and moonstone to direct your love of humanity and of self to appear loving and confident. 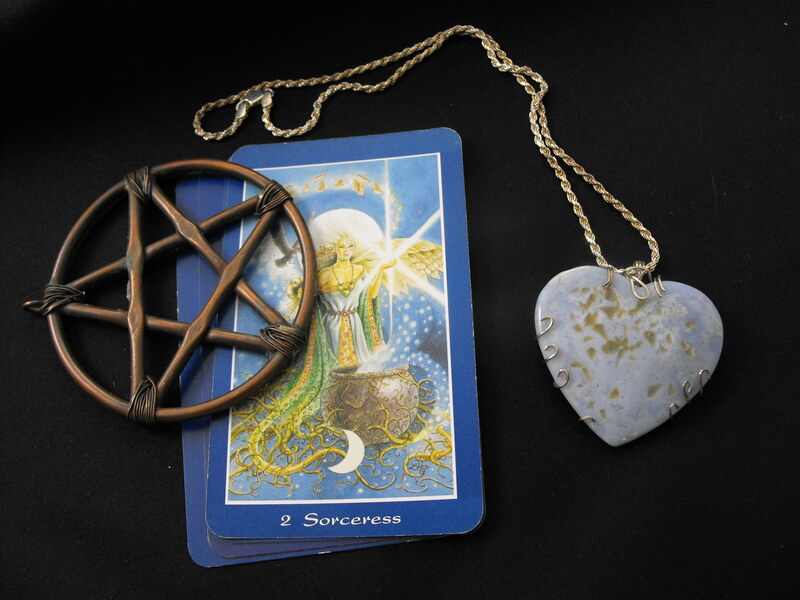 Wear blue lace agate to exude energy that opposes depression. Your middle finger can speak volumes without a ring! Disregarding the traditionally well-known extension, your middle finger is metaphysically associated with intuition and inspirations. On your left middle finger, wear amethyst to receive creative ideas or hunches. Wear a ruby to enhance your beauty. 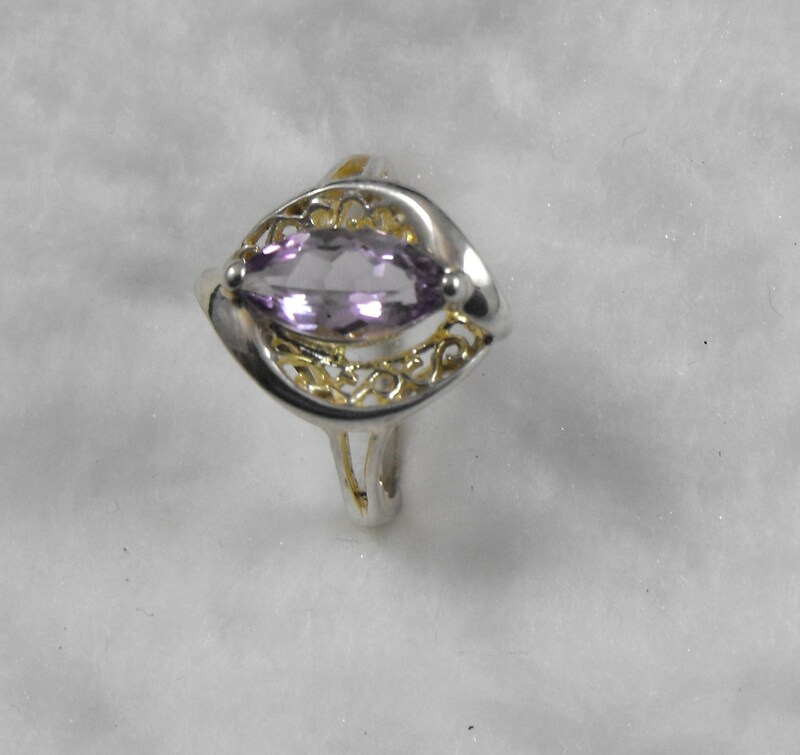 On your right middle finger, wear amethyst to act on hunches correctly or to put your ideas into action. Wear a ruby to appear on present yourself as beautiful. Your ring finger is associated with love (we all know that from wedding ring tradition) and with crative stimulus. Wearing a diamond on your left ring finger enhances love ties. Wearing an emerald will help you get new ideas. 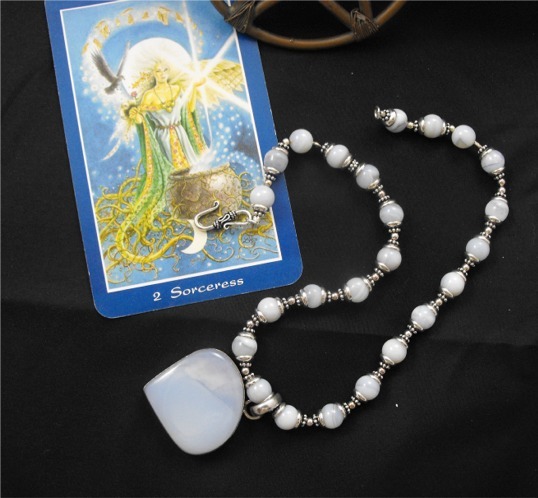 Wearing a moonstone helps you combine what you love with creative ideas. On your right ring finger, tigers eye or ct’s eye will put creative insights into proper action. 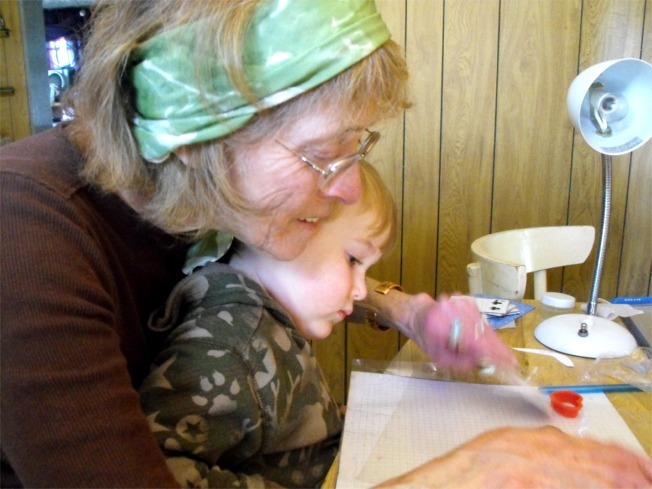 turquoise will combine creative ideas with practical actions. An opal will put your ideas into humanitarian goals and actions. Your little finger is associated with change and opportunity. You could wear aventurine on your left little finger to open doors and invite opportunity. You could wear aventurine on your right little finger to act on new opportunities. Of course, there are hundreds of different stones other than the ones I’ve used for examples. These few just give you anidea of the difference between wearing one stone on your left hand and the same stone on your right corresponding finger. Once you know what type of stone you need for your own life situation, then decide where to wear it. Confused? Not surprising. Ages ago, when the meanings of stones were more commonly known, the decision was easier. These days, when stones are available to the masses, not just the ruling classes, much of that knowledge has been lost. Tell you what. Just for reading this blog, I’ll give you a free stone consultation. Just email me Stregajewellry@yahoo.com, put blog consultation in the subject line and I’ll help you find the right stones for your situation. There’s absolutely no obligation to buy any jewelry from me so don’t be shy. Have some fun and find out what you need. For the past week or so, I’ve been involved in a ‘net thing called Yahoo Answers. Anyone can go there and ask a question. Other folks try their best to give a good answer based on experience or what they have learned elsewhere. Well, most people try anyhow. Once in a while you get someone who just wants to make a wisecrack or come down on someone else. I, of course was interested to know what people were asking about jewelry. I was amazed to find a large number of posts that linked to a picture of a dress and asked “what kind of jewelry should I wear with this?” Guess I thought everyone just “knew” what looked good on them. Gave me a whole new perspective on what I might blog about. I thought that I ought to get back to basics and talk about first things first. If you are going to choose jewelry for yourself, the first thing you should think about is not the outfit itself, but what looks good with your birthday suit. That’s right. Start with what you were born with. Your face is the first and foremost place. What shape is it? You want the pieces you choose to make the best of the features you already have or to minimize any “faults” you might find with your looks. Ladies, if you have a round face choose jewelry that slims, pieces that create the illusion of length. Pick a piece with a strong focal point. Or go for square stones. 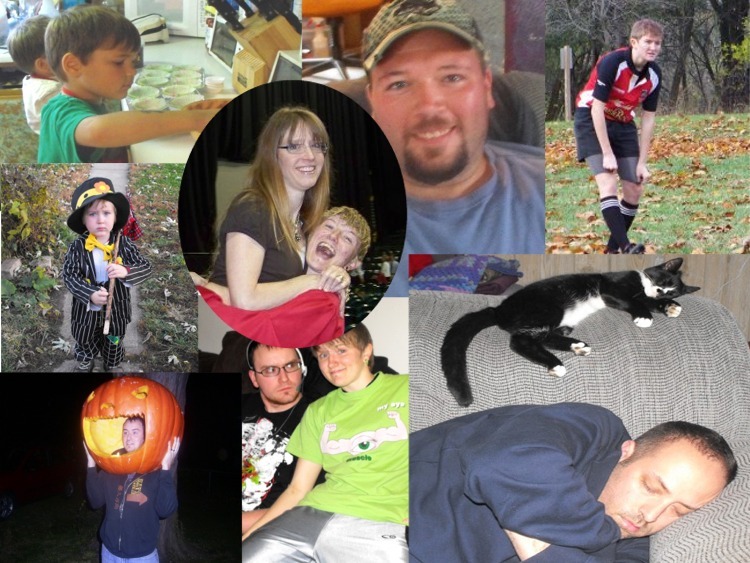 I’m going to include some pictures so you can visualize better what I am saying. This piece would be really great. The cord is simple fiber, slim and weightless and the rectangular shape draws the eye downward. How about earrings like these? 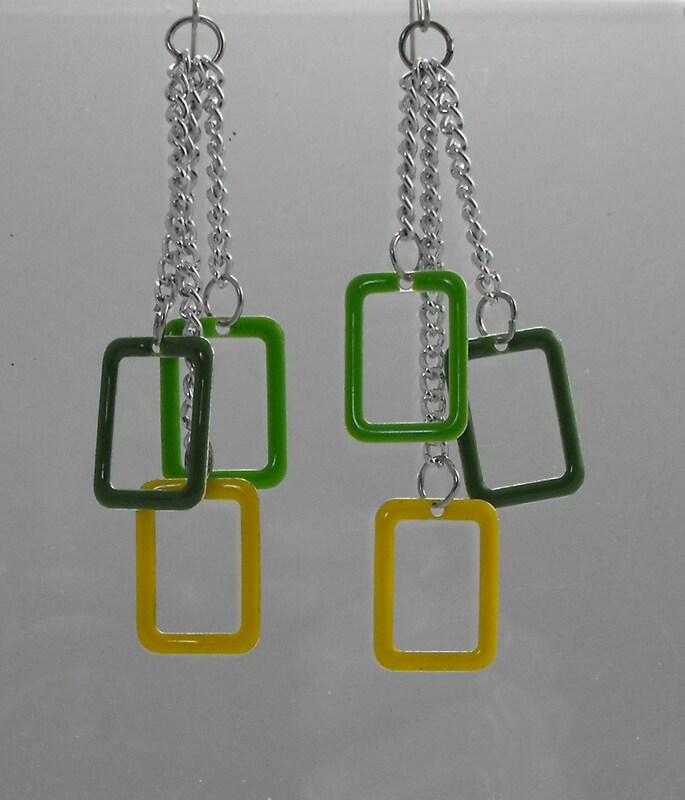 They are long and dangly and the rectangles draw the eye downward as the shape takes away from the roundness of the face. If you have a heart shaped face, you want to give the illusion of width to your jawline. 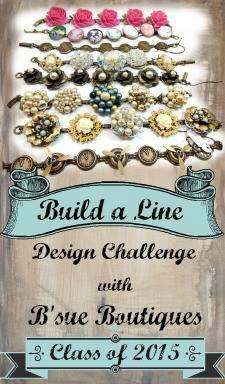 Wear a necklace with a strong horizontal line or wear chunky beads. The best earring type is a triangular style and not too long. 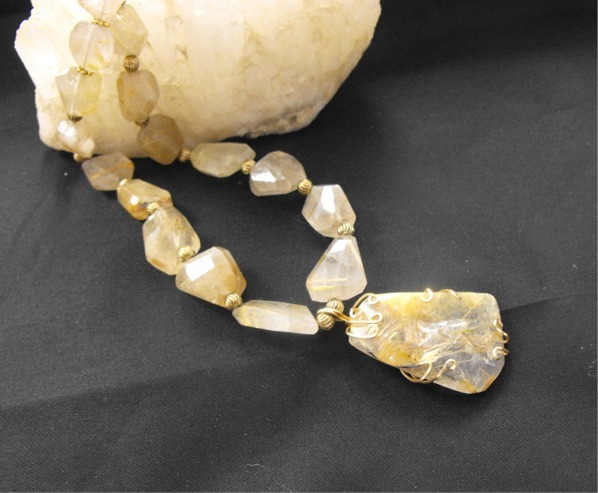 This necklace of rutilated quartz might be a bit too fancy for your taste (or not, if you like bold and beautiful) but it gives you an idea of the chunky beads I’m talking about. Notice how that centerpiece widens out at the bottom. That will draw the eye outward, just where you want it to go, away from the point of your chin. If your face is square, you want to wear curvy earrings and a curvy necklace that draws the eye downward, making your jawline appear longer, not wider. 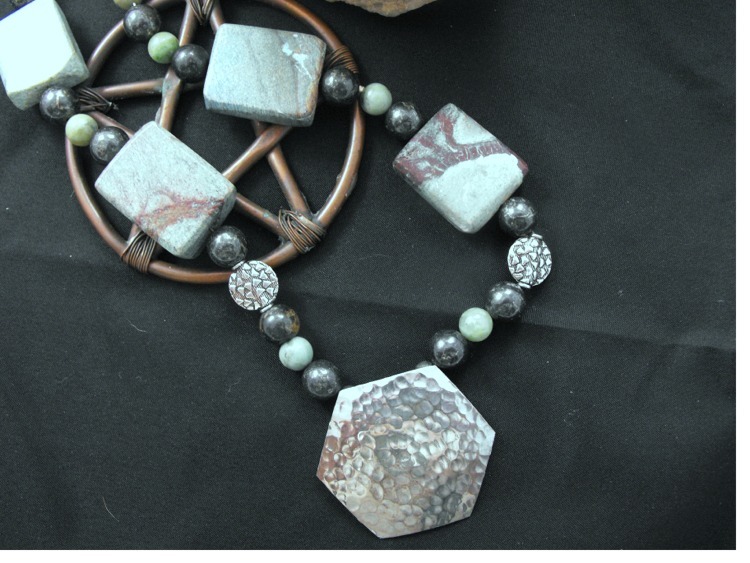 Try something like this jasper necklace. It curves gently, then takes they eye downward and curves again. If your face is shaped more rectangular than square, keep the focus closer to your face, but still keep the curve. 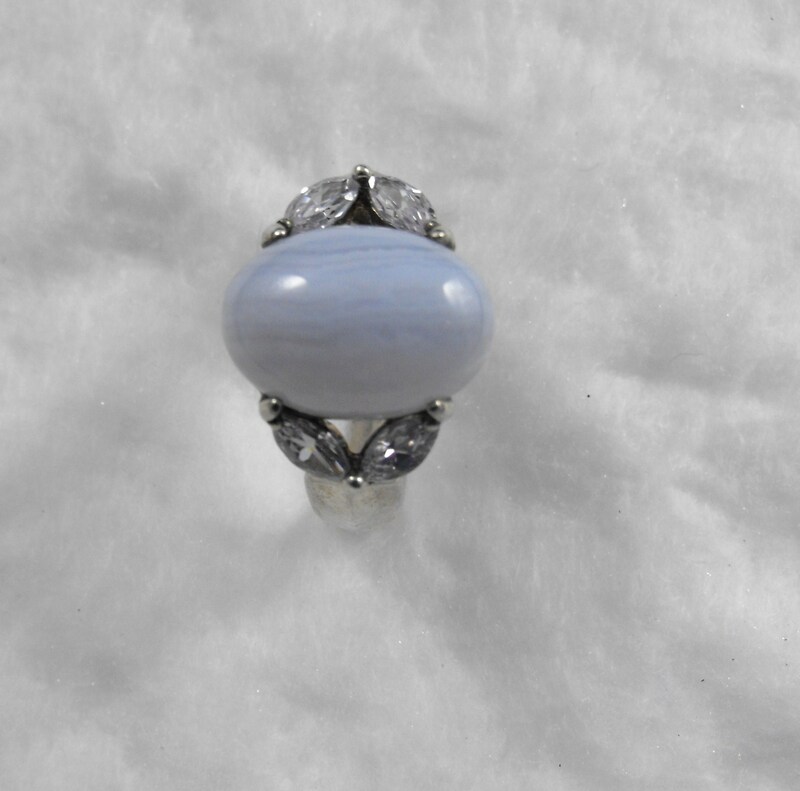 This blue chalcedony necklace is shorter and has a curvy shape that would look good. If you have an oval face, you’ve got the ideal shape for any style. Lucky you! Feel free to play with combinations of shape and texture. Check out this turquoise necklace, round beads, square beads, chunky beads and an odd shaped focal bead of silver. Anything goes! Okay, that about covers the basics on faces. Next time, we’ll move a little farther down and talk about necklines.